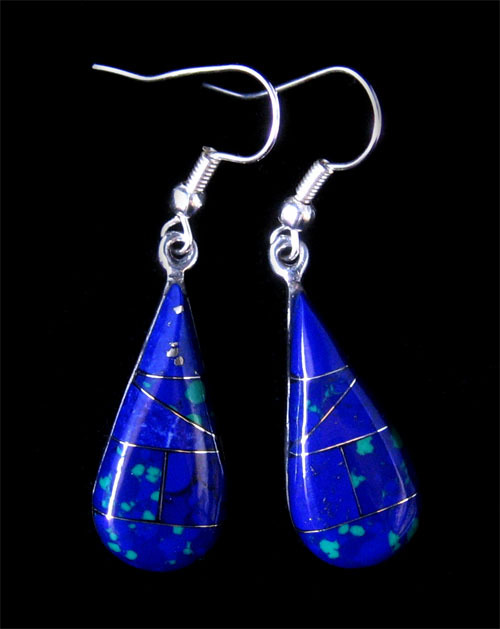 These german silver Zuni inspired inlaid stone earrings have beautiful malachite-azurite semi-precious stones. They are mounted on hypoallergenic french ear wires. Each earring measures 1/2" wide (1.3cm)at the widest end by 1" long (2.5cm), not counting the ear wires. Priced each, but sold in multiples of 3. Hand crafted! Only 11 pairs left. However, you can combine these with other earrings in this category that are the same price to reach deeper discount levels. Our catalog will automatically recompute prices when a new discount level is met.